HORNBY R602 TRACK POWER CONNECTING CLIPS, OO GAUGE MODEL RAILWAY SIX OFF. 5 out of 5 stars - HORNBY R602 TRACK POWER CONNECTING CLIPS, OO GAUGE MODEL RAILWAY SIX OFF. 13 product ratings13 product ratings - HORNBY R602 TRACK POWER CONNECTING CLIPS, OO GAUGE MODEL RAILWAY SIX OFF. 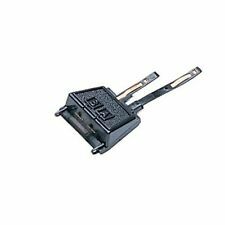 HORNBY R602 POWER CLIP. GOOD FOR DC OR DCC. VERY GOOD- MISSING HAND RAIL. VERY GOOD-- UP TO A COUPLE OF FAINT MARKS. (ie- A COACH THAT HAS NO/OR A COUPLE OF FAINT BODY MARKS BUT HAS A HANDRAIL MISSING OR SNAPPED OFF. ). 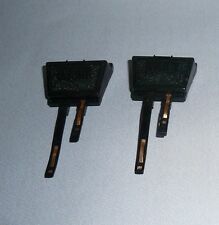 Hornby R602 Power clip power-clip-2. Hornby R8014 Mark 2 Point Motor. Should these circumstances arise, we will notify you. You might also like. © Hattons Model Railways. PICK UP OPTION. Scale - (gauge): 00 Not for use by very young children Used for electrical connections to the track Suitable for analogue systems Easily connected to track and control unit . Hornby R602 Power Connecting Clip. WE WILL DO ALL WE CAN TO HELP RESOLVE ANY PROBLEMS. OPPORTUNITY TO RESOLVE ANY ISSUES. USED AND UNBOXED, BUT IN GOOD CONDITION.